1. Remembering my trip to Rome, one of my fave cities ever!/ 2. New leo 2013 diary with my Glamour magazine/ 3. Break time at Ikea/ 4. Hello beautiful sculpture/ 5. Xmas is almost here! :)/ 6. Watching another basketball match/ 7. New Kate Moss lipstick, love that color so much/ 8. Another break, with hot chocolate/ 9. Making DIY Ikea meatballs, yummy!/ 10. Enormous Christmas tree at Bilboooo!/ 11. I want to ride my bicicle, I want to ride my bike.../ 12. Home, sweet home/ 13. The tree again, love it!/ 14You can still join my GIVEAWAY by clicking here/ 15. Cozy afternoon, loooove candles. Rome will always have a special place in my heart too. Lovely set of photos, are those churros and hot chocolate?! they are so yum! The lit up tree looks beautiful. The view is gorgeous from the first photo! Where were you? At the top of the Baticano!!!!!!!! 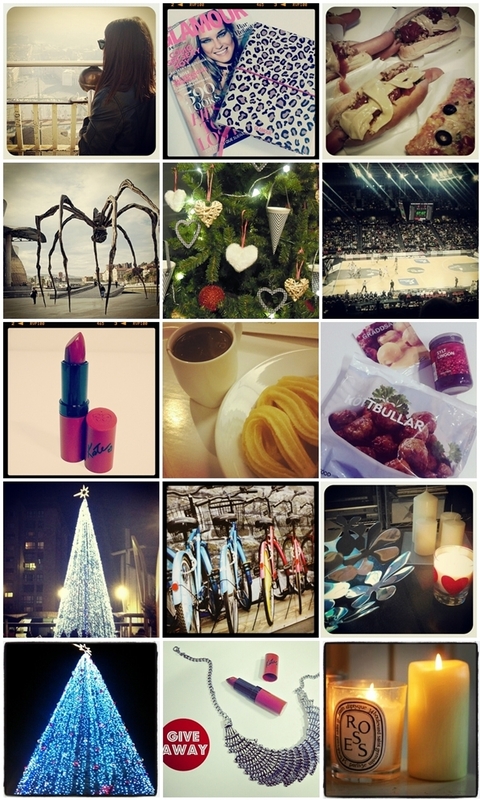 I also love instagram! :) nice photos you have there!